Can I use my current dog or do I need to get another dog? If you have a dog, we will assess your dog’s temperament and trainability to see if the dog is suitable for Service Dog work (click here to review the criteria.) If not, we will help you find one of our ‘Available Assessed Dogs’ or another dog (from a local rescue or breeder) to meet your needs. How many dogs do you train at one time at your facility? We do not have a “facility”. We have 25 trainers that train each client individually with their dog. Training sessions are usually once per week, and we train the dogs to pass the Public Access Test standards while simultaneously creating a bond between the dog and the handler. Tasks specific to the client’s disability will also be trained. The first training session is done at the client’s home, if possible, where the trainer will gather information regarding the client’s needs and meet with the family, when applicable. The cost of training a dog as a Service Dog is determined by your location and whether you own a trainable dog or require a dog. Please check out the cost page. Does insurance cover the cost of a Service Dog? Some insurance companies do cover the cost of a Service Dog. However, since there are numerous insurance companies, it is recommended that you discuss your needs with your insurance provider. Does Veteran Affairs (VA) cover the cost of a Service Dog? Training may be paid for by the VA. This applies to veterans who specifically apply for Service Dogs through the VA if they need Guide Dogs or have prosthetics. In that case, the VA may agree to provide dogs with training for these individuals. Do I need a doctor’s note or prescription to be eligible for a Service Dog? We do not require a doctor’s note or a prescription for training. However, you may need one if you take your Service Dog to your place of work and/or school. In addition, your insurance provider may require one if you request your provider to cover the cost. When requesting a note please ensure the doctor states it is a Service Dog and not a Therapy or Emotional Dog. A Service Dog has more legal status then a Therapy or Emotional Dog. What kind of training do the ‘Available Assessed Dogs’ have? All of our ‘Available Assessed Dogs’ are fully housebroken, crate trained, assessed for temperament and trainability, and various degrees of basic commands. Each listed dog’s amount of training is available on the dog’s profile. Is there any training inside a home? Ideally, there is training done inside the home with the client’s trainer. Training is expected continuously by the client and dog in the client’s home between sessions. Our trainers come to your home (if applicable) to sit and talk with the family about their needs, concerns, etc., and explain the process of how we train. Of course, training outside the home would occur where the dog and handler learn how to work with their dog in public. What sort of obedience training will the dog get and will the dog be public access trained? The dog will be trained to eventually pass the Public Access Test (PAT). The PAT is basic obedience plus very advanced commands. We use the exact same test as administered by Assistance Dogs International. Advanced commands also include tasks specific to each client’s disability. What breed of dog do you use? Are there options? We use all rescue dogs of any breed that have been thoroughly assessed for temperament and trainability by our professional assessors. You may specify any breed you want, or you have the option of going to a breeder. All of our current assessed dogs are listed on “Assessed Available Dogs”. Is information provided in regards to the parents of the dog? Breed line? Since all of our dogs are rescue dogs (part of our mission is to save the lives of these highly-capable dogs with amazing potential who are at high risk of being euthanized), there is no information about breed line. If you want a purebred dog from a breeder, we can assist you in finding a good one for the particular dog breed you are interested in. Are the dogs spayed/neutered? Is this covered in the cost? All dogs are spayed and neutered, are fully-vetted including vaccinations, heartworm tested, and are currently on monthly heartworm and flea/tick/parasite preventatives. All of the dogs we assess and use are spayed and neutered for behavioral and health issues. Is there open communication with previous families that have received a Service Dog through your organization? We have a Blog, Twitter and Facebook site where we post, with written permission of each client, the training of each dog. Families can learn from others’ experiences and communicate with each other at any time. How long do you provide assistance after the families receive their Service Dog? We follow-up after training is completed four times a year, and once a year after that to check on continuity of training. You can always contact us at any time as long as the dog shall live with any questions either via email or telephone. All dogs are fully vaccinated, and you are required to continue with yearly vaccinations and provide proof of heartworm and flea/tick/parasite prevention each month during training. Are vaccinations done at a vet or onsite? All dogs are vaccinated by a veterinarian. We also work closely with a Veterinary Hospital in San Antonio that has worked with our program since its inception, and provides 25% off ALL Service Dog vaccinations, treatments, medications, check-ups, surgeries if needed, etc. However, to utilize their discount, you must require proof that you are a Service Dog Express client. You can use any veterinarian you feel comfortable with within your area, of course, and ask if they would offer or “match” this 25% discount. Are vet records provided to the families before adoption of the potential Service Dog? All of our dogs come with full veterinary/medical histories. In addition, you may also be asked to fill out adoption papers by the foster/rescue that is housing the dog. How much do your Available Assessed Dogs cost? Each Available Assessed Dog has a different adoption fee according to where the dog is being fostered or housed with a rescue. On average the fees range from $125-$200+. Service Dog Express does not set the foster/rescue’s adoption fee nor does Service Dog Express sell dogs. In addition, the Service Dog is considered a “medical device” according to the IRS, so it is tax deductible, even while the dog is in training. ALL items pertaining to your Service Dog, including food, training, travel to/from training sessions, etc, are also tax deductible. What is your relationship with animal rescue organizations? We work with numerous dog rescue organizations in San Antonio, Dallas-Fort Worth, El Paso, Central Texas and other locations in an effort to provide a home for dogs that have potential Service Dog (SD) qualities. This joint effort helps reduce the rescue dog population, lowers euthanization rates and provides individuals with disabilities the chance to improve their quality of life. The rescue organization informs us of dogs they believe would make potential excellent SDs. We then assess the dog per the request of the rescue. If the dogs are indeed potential SD quality, we will post pictures and descriptions of the dogs assessed that are being housed/boarded at that rescue. We do not board/house dogs since we do not have a facility to do so; hence the relationship we have with the rescues. The rescue that is housing the assessed dog is not obligated to hold the dog for only our potential clients. In the best interest of the dog, our goal is to find a loving home for the rescue dog if the opportunity presents itself. When a client comes to us looking for a SD, we inform them of what dogs are available that meet our temperament and training criteria for potential SDs. In addition, we inform them that the listed dogs are not fully-trained and that specific and custom training for the client’s needs are trained once they have ownership of the dog. We inform the hosting rescue that a client is interested in one of their assessed dogs, and the rescue and the client make arrangements for the client to adopt the dog. How much training is provided to the family? Our training process is all done with the family involved as much as possible. Having a Service Dog means that the family must be fully involved in the process in order for the process to work. What sort of training is included? Our training process is included in a training e-manual. 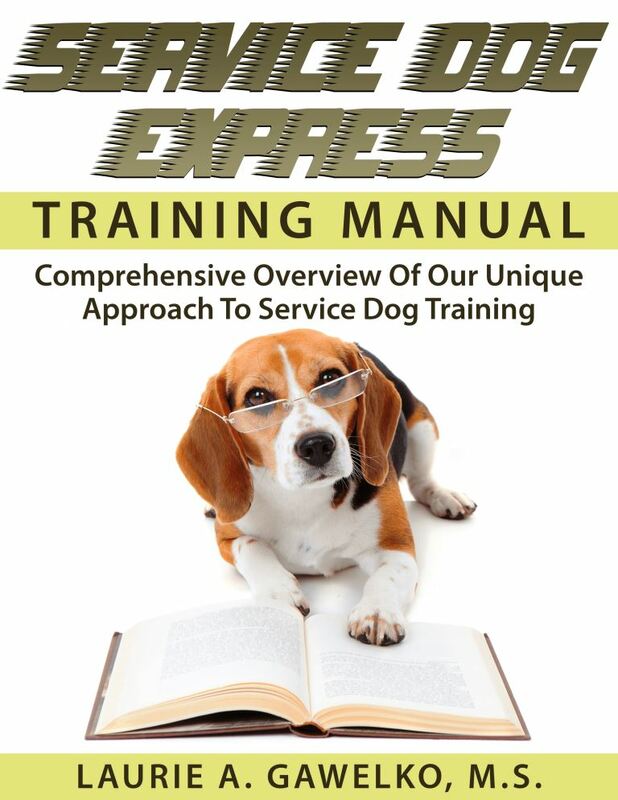 The e-manual explains the basic training that the dog needs to learn to pass the Public Access Test. Additional training specifically targeted to the handler’s needs is included in the training. The e-manual also includes information on how to get special items for the Service Dog, including but not limited to vests, ID’s, leashes, etc. Are there standard checks at the end to make sure the dog performs? At the completion of training, the dog must pass the Public Access Test and also be able to perform all tasks specific to the handler’s disability. Will my Service Dog be “Certified” at the end of training? Your Service Dog will be trained adhering to Assistance Dog International standards. There is no such thing as a “certified” Service Dog. Do I need to register my Service Dog? There is no federal database or requirement to register your dog as a Service Dog. Online registration sites do not offer any additional legal status that your trained Service Dog already has. Can I adopt a dog on the Available Assessed Dogs as a pet? All dogs listed are for potential handler/owners that need a Service Dog. Can I adopt a dog on the Available Assessed Dog and train the dog myself to be a Service Dog? According to current laws, guidelines and regulations, anyone can self-train a Service Dog. If you go through Service Dog Express and adopt a dog listed on the Available Assessed Dogs page, you must train the dog with us. Under rare circumstances (i.e. moving to a new location), we will help coordinate finding an appropriate Service Dog trainer for the dog in a new location. We will follow the training and provide guidance when needed for the life of the dog. What is the process of donating my own dog/puppy to your program? What do I do if my Service Dog and I have been have been asked to leave or denied services at a business? Be well versed in ADA law (ADA requires businesses, that serve the public, to allow people with disabilities to bring their service animals onto business premises in whatever areas customers are generally allowed.). If the business does not comply with the recitation of federal law, call your trainer or Service Dog Express (210-201-3641 or 855-778-2364) ASAP. We will be happy to speak to the business owner/manager on your behalf. If the business still does not comply – call the police immediately and wait for their arrival. An excellent video describing access for Service and Assistance Dogs, produced by the American Hotel & Lodging Association (AHLA). It was created by the AHLA’s affiliate, the California Hotel & Lodging Association. 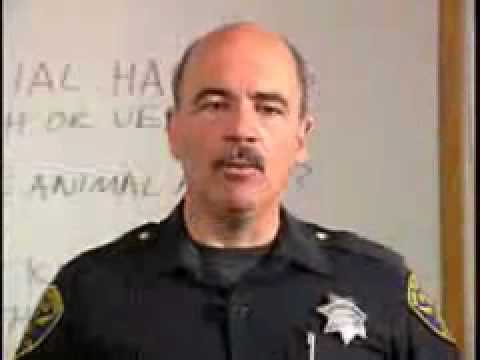 It is also a helpful training video for police departments who may be called upon to help Service and Assistance Dogs gain access and/or issue citations to violators. This is very, very important for all Service Dog Express clients to understand regarding Airline Assistance requests. I (Laurie, CEO) get a LOT of requests for help with Airline Travel, which is very important because I make sure that the airlines know that each client is flying with a Service Dog, and I know to emphasize with the more “stringent” airlines that SD’s that help people with psychiatric disabilities are called in by me as MEDICAL ALERT SERVICE DOGS. This is truth, because the ADA no longer even uses the term “psychiatric Service Dog” – they have been put in the same category as ALL Service Dogs, because psychiatric disabilities are literally medical conditions affecting the brain. I have to reiterate to many airlines that it is NOT an emotional support animal, because if they ask what the SD is for, if I say ANYTHING that resembles something psychiatric, they often don’t follow the ADA laws and they will immediately classify it as an ESA: requiring extensive paperwork, a fee, etc. I have learned very well how to work with the more difficult airlines, such as American. I reiterate to them that once they have listed the SD, they REPEAT back to me that the handler is not required to show ANY paperwork – simply that the SD is vested and has proof of rabies. I then verify with the airlines that the handler and SD team will be guided into the Priority TSA screening line, and get priority boarding. I have been working for years with Congress and to revise the Air Carrier Access Act so that Service Dog handlers who have psychiatric disabilities are treated no less respectfully as clients who have other disabilities. It is a long work in progress. If you are a SDE client and need assistance with the airline, please click below. What is the best breed to be a Service Dog? Any breed of dog can be a Service Dog. It all depends on temperament and trainability of the dog and how it relates to the potential handler/owner’s disability. What is the origin of the name of Service Dog Express? It was an idea of going from one direction to another – like riding a train, where you make stops and meet new people who are experiencing a journey similar to yours – looking out the window and enjoying the scenery and arriving at your optimal destination. In essence: a Service Dog training journey from one point to another. How can I become a Service Dog trainer? Visit Bergin University or search the web for Service Dog training programs. A common misconception about the Service Dog field is that it’s all about the dogs. In reality, it’s about helping people through the assistance of highly-trained dogs. Regardless of the amount of love one has for animals and dogs, they also must think of themselves as a “people” person. They will be training, guiding and exercising compassion and awareness with people with a variety of disabilities. They should be diplomatic, flexible and creative when working with people to ensure that their needs are met. While all good trainers must respect their dogs, the main goal is to empower a person with a disability. If you would like to be part of the Service Dog Express team, please send us your qualifications and your desire to help others.